If you have been following my blog and/or social media channels for a while, then you would know that I have just returned from leading a Wild Eye photographic safari to the renowned Chobe river ecosystem between Botswana and Namibia. The photo opportunities my guests and I were blessed with were legion - and I've got so many new and interesting images to share. Though the Chobe National Park boasts the highest density of elephants in southern Africa, I thought I would kick off the sharing of images from this trip with something different - an image I have been wanting in my portfolio for a LOOONG time. It's not anything new or groundbreaking, but it is a classically African image, and I am glad to have added it to my portfolio after this safari. 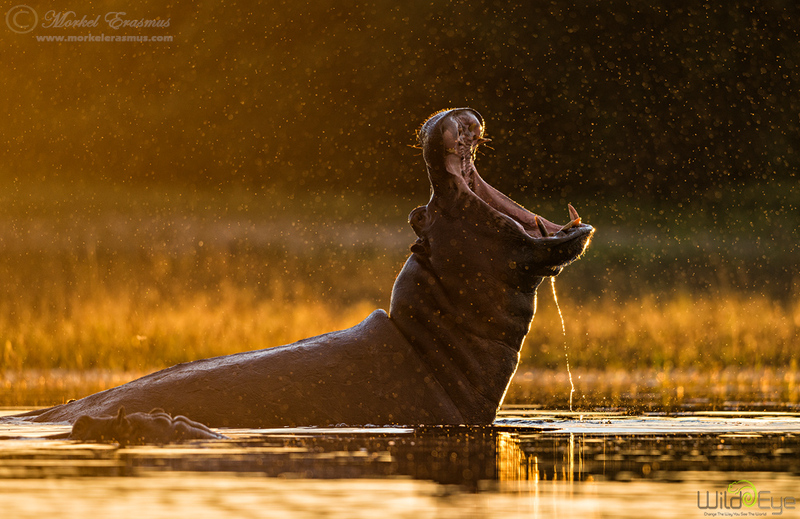 As we were approaching a pod of hippopotamus in the last light of the day, the sun just broke through the clouds for a moment, and I instructed our guide and boat driver Patrick to position us so that we can photograph silhouettes of the hippos against the backlight of the sunset. Just as we were nearly in position, the dominant bull of the pod reared up and gave a characteristic display of dominance with his mouth open. It was over in 2 seconds, and I was pointing my lens in that direction but not expecting anything. I quickly focused and fired off 4 frames with the boat still rearing to a stop, of which I liked this one the best. The golden glow and rim-light was achieved by dialing in an exposure compensation of -1.3 on my camera. The mood was enhanced by the light also hitting the thousands of insects flying about along the surface of the river. I hope you like it! I will be posting a full trip report on the safari on the Wild Eye blog soon, so watch this space. Magnificent image, love the time of day and the incredible moment of capture. I would love to be there to see this live. Thanks Mitch. It was indeed special to see (albeit over too fleetingly).